The only way that Russia can achieve — and sustain — targeted annual growth in the range 4 to 5 percent is with full engagement with the East and West rather than trying to play one off against the other. Over the past two months, as the crisis in Ukraine has escalated, one of the expressions to have appeared most often in reports concerning the economy has been “sanctions risk” to convey the danger posed to Russia's well-being by the restrictions imposed, or threatened, by the U.S. and Europe. Over the next two months, the most over-used expression is bound to be “pivot East” or “Asian pivot.” For too many people in government, the simple solution to an increasingly difficult relationship with Western countries will likely be to turn East— to develop new trade and investment deals to replace the increasingly problematic Western relationships. A cursory glance at the comparable statistics between East and West might suggest this to be not such a bad idea. For example, the three largest Asian economies — China, Japan and India — have considerably larger savings and therefore greater discretionary investment potential than the three largest Western economies: the U.S., Germany and France. A recent report from the World Bank's International Comparison Program shows that the top three Asian economies have a combined gross domestic product on a purchasing power parity basis of $23.6 trillion compared to that of the three big Western economies of $21.5 trillion. In addition, the International Monetary Fund forecasts 2014 GDP growth at 7.5 percent for China, 5.4 percent for India and 1.4 percent for Japan as the latter finally starts to emerge from two decades of deflation. By comparison, growth in the U.S. is expected at 2.8 percent and, across the eurozone, it is expected to be 1.2 percent. Surely it is an obvious no-brainer to switch focus to the bigger, faster-growing and wealthier Asians than stick with the increasingly belligerent Western countries. There is plenty of scope to develop more Asian business. Less than $50 billion of the accumulated $500 billion foreign investment in Russia, excluding the Rosneft and Pacific pipeline deals, came from Asian investors. Russian trade with Asian countries totaled $150 billion last year, or one-third of trade with Europe. But while there is certainly plenty of scope to boost Asian ties, it would be a disaster for the economy in the long-term if the country were to adopt a pro-Asian bias coupled with an anti-Western bias. The only way that Russia can achieve — and sustain — targeted annual growth in the range 4 to 5 percent is with full engagement with the East and West rather than trying to play one off against the other. Russia certainly needs capital investment to improve infrastructure, and it needs a source of financing for the banking system and capital markets. This it can get from Asia and the Middle East — as the Russia Direct Investment Fund showed in 2013. But more important, Russia needs to utilize the know-how and technology of foreign companies. While centers of excellence exist in many Asian industries, the bulk of the skills needed to modernize Russia's economic base and make it more efficient can only come from long-established Western companies. For example, Russia needs to develop the country's offshore hydrocarbon resources in the Arctic and in the deep waters off Sakhalin. It needs the experience and technology from the likes of ExxonMobil, BP or Shell rather than just money from China's CNPC or India's ONGC. Agriculture, food production and pharmaceuticals are also priority development industries, which can only realize full potential in any reasonable time frame with the big Western food and pharmaceutical companies. This may also not be a good time to shift reliance from the West to the East as serious question marks have started to appear over the stability of several big Asian economies, not least of which is China. The economy is on track to record growth of close to 7.5 percent this year, but the warning clouds have started to gather in the form of an all-too-familiar combination of fast credit expansion and a property bubble. Charlene Chu, a senior analyst at ratings agency Fitch, was forced to resign earlier this year because she published a report that concluded that a banking crisis of some magnitude is now a certainty in China. She warned that action needed to be taken now to prevent that inevitable crisis leading to a crash in the over-inflated property market, which would also seriously derail the economy as happened in the U.S. from 2008 to 2009. Her conclusions were met with the inevitable “But it is different here.” And it certainly is different in China, but not in a comforting way. Consider this statistic: The Chinese credit market has expanded by almost $13 trillion since 2008. The Chinese credit market has in five years grown in volume more than the entire U.S. commercial banking system has over the past 100 years. Chinese credit is still annually growing at twice the pace of GDP growth. Nobody knows how to stop the spinning merry-go-round without risking a catastrophe in the property market, in the banking system and in the broader economy. The optimists say that the “system will adjust itself” as it matures. The reality is nobody knows how this is going to play out. Never in history has such a large economy grown so fast for so long and with so much credit expansion. Whatever happens next will be without historic precedent in terms of scale and global impact. The government needs to find a mechanism to shift the main economic driver from credit-fueled investment to consumption. That is one area where Russia and China certainly complement each other as the respective economies have exactly opposite problems. If only economics were that simple. 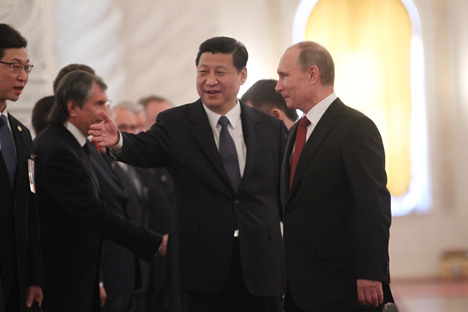 It is widely expected that after 10 years of talks, President Vladimir Putin will agree a deal to export almost 40 billion cubic meters of gas annually to China during his official visit to Beijing later this month. That deal will then be one of the highlights, if not the centerpiece, of the St. Petersburg Economic Forum, which starts May 22. It would be a shame if it is presented as the start of an Asian pivot and a pivot away from the West rather than sensible diversification. The China gas deal should eventually be followed up with a similar deal with South Korea after Moscow wrote off $10 billion of North Korean debt on the condition that it allows a gas pipe and rail link into the south. Putin is also scheduled to make an official visit to Japan in the fall, where an energy for investment and trade barter will undoubtedly be among the discussion points. Russia needs a great deal of inward investment and especially the sort that comes by way of joint-ventures and public-private partnerships with investors — not only with money, but with skill sets and with proven technology. Russia needs to work with new Asian partners for sure, but it needs to complement rather than replace the established relationships among those already active in and committed to Russia. Otherwise, Russia risks becoming one big gas reservoir for the big Asian economies. Chris Weafer is senior partner with Macro Advisory, a consultancy advising macro hedge funds and foreign companies looking at investment opportunities in Russia.